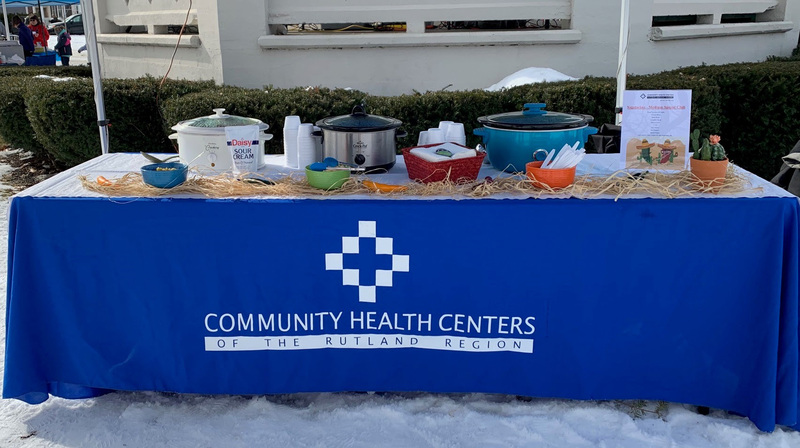 Vermont Business Magazine On a cold winter day, Community Health Centers of the Rutland Region (CHCRR) volunteers cooked up an award-wining batch of vegetarian chili at the Rutland Chamber of Commerce Chili Cook Off. “We’d never before won a prize,” said Jill Jesso-White, the CHCRR compliance officer and chili cook. “But we have always paid attention to food and nutrition and as part of our focus on health and wellness for our patients as well as our employees.” CHCRR volunteers kicked off National Nutrition Month with this delicious and nutritious recipe developed by CHCRR volunteers. This year, CHCRR's wellness initiatives support several programs that focus on fresh foods and nutrition education for everyone. CHCRR will take part again this year in the Farmacy Project, a health care share program with the Vermont Farmers Food Center. Now in its fifth year, the program looks at fresh produce as a prescription for wellness and "medicine" for food related illnesses. CHCRR providers and patients fill out an application. Then, once a week, produce and a healthy recipe are packaged for pick up at CHCRR's Rutland Community Health Center. Ten to 12 pounds of fresh produce and cooking suggestions are made available to each person who signs up for the program. Year round, CHCRR's website has nutrition information for toddlers, children, pregnant women and seniors and provides resources and recommendations for nutrition education services to help limited resource families learn to shop smarter, eat healthier and save money. CHCRR employee newsletter editor Pam Forte featured National Nutrition Month as one of the themes in the March issue. "National Nutrition Month is an annual nutrition education and information campaign celebrated each year during the month of March. The idea was developed by the Academy of Nutrition & Dietetics to focus on the importance of making healthy food choices along with good habits of physical activity, which we encourage and support at CHCRR," said Forte. National Nutrition Week was initiated in 1973 and became a month-long observance in response to public interest. The overall mission is to use the power of food and nutrition in our busy lives and learn how to make good decisions without sacrificing health in order to find the best food options with the most nutritional value. Fortunately, discovering foods rich in vitamins and minerals has become easier. There are more choices for less processed and less caloric foods than ever before. You just have to look. Most supermarkets and restaurants offer a variety of choices for all types of diets. For more information about National Nutrition Month, check these websites nnm@eatricht.org and www.foodandhealth.com. CHCRR is central Vermont’s largest network of primary care, pediatric and dental services with offices in Rutland, Brandon, Castleton, West Pawlet and Shoreham. Community Dental offices are located in Rutland and Shoreham, CHCRR Pediatrics is in Rutland and CHCRR’s Express Care centers, open 7 days a week, are located at the Rutland and Castleton Community Health Centers. Behavioral health providers are available at all of CHCRR's locations.